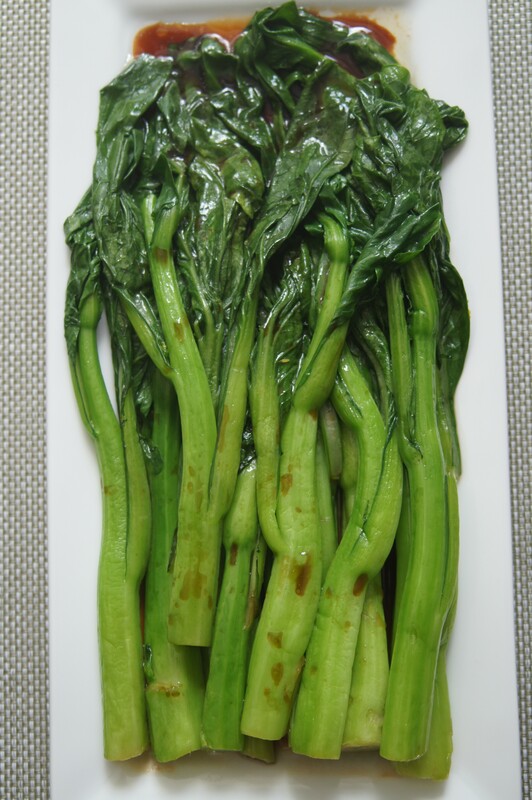 One of the things that I like to order that isn’t a dumpling is the yu choy, which is a Chinese leafy green with a broccoli-like stalk. It’s crowned with a dollop of oyster sauce (which sometimes isn’t made with actual oysters. More on that below). I like to think that by eating this delicious vegetable I’m cancelling out the eighth shu mai I’ve eaten. OK, eight might be an exaggeration. Six. All right, seven. When The Woks of Life first posted this on their blog back in January, I was so excited. I didn’t care that the temperature was in the single digits that day. I walked to Chinatown during my lunch break and bought a package of yu choy, all excited to make it when I got home. The cold walk was worth it and it did not disappoint. It’s called Easy Yu Choy because it actually is so incredibly easy to make. I renamed it Easy and Flawless Yu Choy because it’s perfect. It tastes just like what I would order at dim sum or any authentic Chinese restaurant in Chinatown. Plus, I’m in love with Beyoncé’s new album (and everything about her) and when I think “flawless” I think of Beyoncé (doesn’t everybody?). And now I also think of this delicious Yu Choy. The seasoning ingredients are easy to find in any well-stocked grocery store – or my little piece of heaven, Trader Joe’s (well, minus the oyster sauce, at least). The ingredients are also available at any Asian grocery store and on-line. If you can’t find Yu Choy you can use broccoli or broccolini. Even though the yu choy is definitely a vegetable, this dish can’t be considered vegetarian because of the oyster sauce. But – and this is a good but (restraining from saying something juvenile here) – there are vegetarian oyster sauce options available. Mushrooms replace the oysters. I’ve tried it before and it tastes just like non-vegetarian oyster sauce. Easy and Flawless Yu Choy is perfect on its own or accompanied with cauliflower fried rice (http://www.thetastypage.com/?s=cauliflower+fried+rice). It’s also perfect while listening to a mix tape that includes Michael Jackson and Beyoncé. Wash the yu choy about three times to remove any hidden dirt and sand from the leaves and stems. Once the yu choy is cleaned, drain in a colander. Then bring a large pot of water to a boil. While you wait for the water to boil, heat 1 tablespoon of oil in a small saucepan over low heat for 30 seconds. Stir in the oyster sauce, soy sauce, sesame oil, and white pepper. Bring the mixture to a simmer, then immediately turn off the heat and set aside. Once the water is boiled, add 1 tablespoon of oil to the boiling water. Add in the yu choy and stir gently. 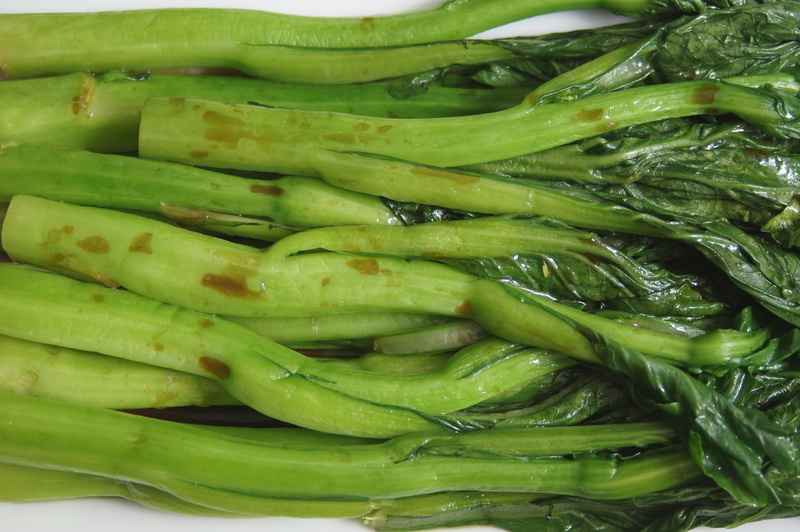 The yu choy will turn dark green in color. Blanch for 30 seconds, but if your yu choy has thick stems, or if you like your vegetables to be more tender, you may want to cook them a little longer—up to a minute or so. If the vegetables are long, you can take kitchen scissors and cut them in half. But you can also leave them as is. Pour the warm sauce over the yu choy and enjoy!